Hell Has Frozen Over, Headline Writers Rejoice : The Two-Way As the tiny town in Michigan has gotten colder, few could seem to resist having some fun with its name. The frigid fame will be short-lived. Hell may be frozen over now, but it's expected to thaw this weekend. A Google News search of that phrase at 8:45 a.m. ET Wednesday turned up 3,980 results. The hardy souls in the tiny town near Ann Arbor don't seem to mind the attention. The "Go To Hell" Facebook page's cover photo has been changed to show the icicles hanging off the "Hell" sign at the edge of town. The town's mayor, John Colone, has gone on BBC4Today to joke about just how cold it is — and to admit rather sheepishly that in an absent-minded moment he put his car key in his mouth while he was outside. Colone said he "had to go and throw water" on his mouth because "it stuck to my lips." Rest assured, just as Hell has frozen over, it will thaw. The Weather Channel predicts temperatures in the area will reach about 40 degrees on Saturday. Oh, and how did Hell get its name? 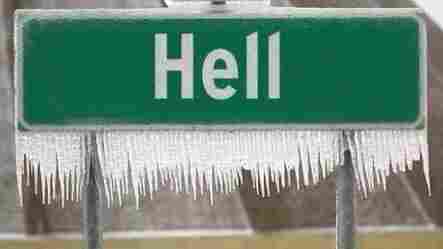 "There are a few theories on the origin of the name for Hell, Michigan. The most popular involves a man in the 1840's named George Reeves who, when asked by officials what he wanted to name the settlement he helped start, replied, 'Call it Hell for I care!' Another story of the town's name comes from the frontiersmen who traveled the low-lying wetlands at the height of mosquito season. After traveling through such wet and infested terrain they referred to it as 'Hell.' "
"First settled in 1838 by George Reeves, Hell started out as a grist mill and general store on the banks of what is now Hell Creek. George's habit of paying local farmers with homemade whiskey made many wives to comment 'He's gone to Hell again' when questioned about their husband's wherabouts during harvest time. This name stuck, and 'Hell' became an official town in 1841." As Morning Edition said Wednesday, there's another theory: The name may come "from the German word for 'bright.' "